When I was in LA for ‘The Voice Finale‘, I made a quick visit to Kitson. HAD TO! You always find something fun a unique there and of course this trip did not disappoint. I bought a few things including this top from Good hYOUman. 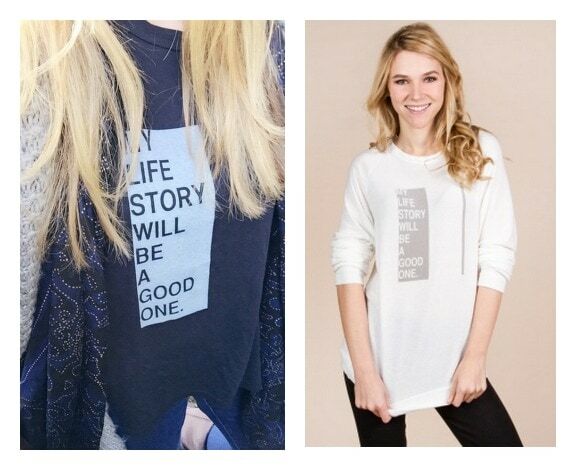 I NEVER… ok, maybe I should say HARDLY EVER… purchase shirts that have sayings on them. It’s just not my thing. But this saying really resinated with me. My Life Story Will Be A Good One. Yup. You better believe it. It’s sort of my motto. So, I snagged it. There’s even a song out on the radio right now that has the same vibe and I’ve been playing it on REPEAT — from OneRepublic “I Lived”. Have you heard it? OMG! Dying!! Flipping love that song!! It all is in the same vein. Make it count. So, this was my LA souvenir. LOL! I wore it for the first time a few days ago and I just had to post about it in case you were looking for something like it too. Super casual. Paired it with skinny jeans and a sleeveless sweater and scarf. Easy. Breezy.